Here are the slides of the talk I’m giving at the CQT Annual Symposium on Wednesday afternoon, which is Tuesday morning for a lot of you. If you catch mistakes, I’d love to hear about them before then! Abstract: Some ideas from quantum theory are just beginning to percolate back to classical probability theory. For example, there is a widely used and successful theory of “chemical reaction networks”, which describes the interactions of molecules in a stochastic rather than quantum way. If we look at it from the perspective of quantum theory, this turns out to involve creation and annihilation operators, coherent states and other well-known ideas—but with a few big differences. 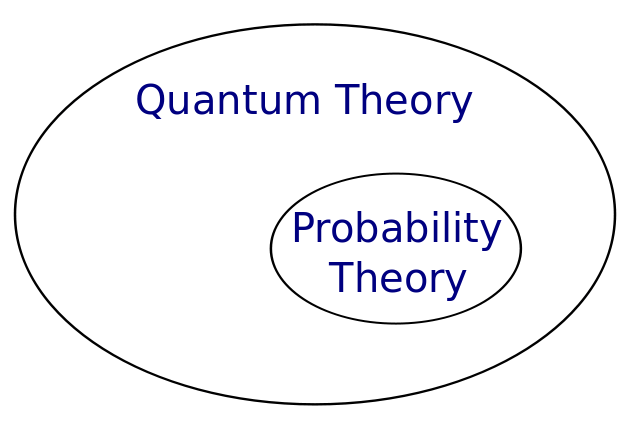 The stochastic analogue of quantum field theory is also used in population biology, and here the connection is well-known. 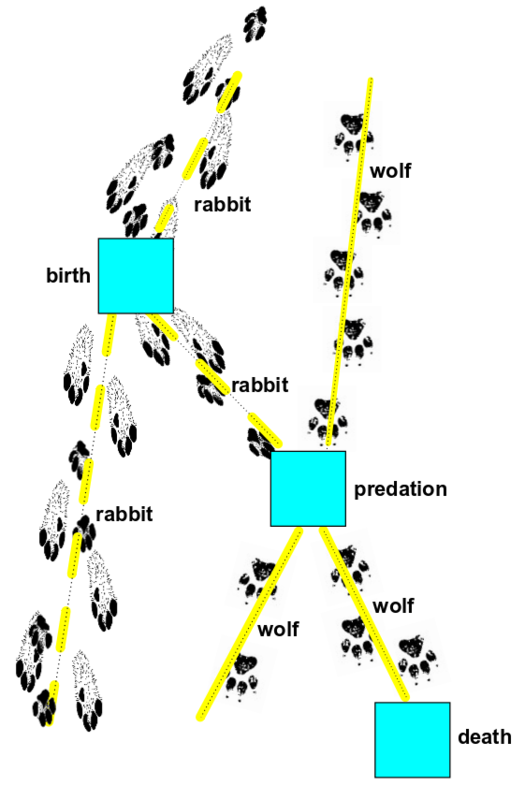 But what does it mean to treat wolves as fermions or bosons? This entry was posted on Monday, December 5th, 2011 at 3:15 pm and is filed under physics, probability, quantum technologies. You can follow any responses to this entry through the RSS 2.0 feed. You can leave a response, or trackback from your own site. On the other hand, some widely-publicized recent work suggest that wave functions can NOT be interpreted as probability distributions for all physical purposes, so maybe the interaction between the ideas isn’t so clear. I’m definitely not saying that wave functions can be interpreted as probability distributions. I’m just saying that dozens of things people do with one can be usefully done with other too. The fact that they’re so different makes this a bit mysterious: that’s where the fun lies. Its also worth clarifying, AS, that the theorem you’re referring to disproves the idea that there is any classical probability at play on top of the fundamental quantum randomness. In other words it shows that all of the randomness is a true “property of the system”. I found the marketing for the paper unfortunate, despite being really interesting and important in its content. You can easily derive nonsensical conclusions if you take quantum states to be non-probabilistic objects. • Matthew F. Pusey, Jonathan Barrett, Terry Rudolph, The quantum state cannot be interpreted statistically. • Matt Leifer, Can the quantum state be interpreted statistically? • Scott Aaronson, The quantum state cannot be interpreted as something other than a quantum state. This other view does not contradict the standard one. I’m not even sure how to begin approaching this, so I’ll start with a simple question. On slide 19, you refer to a “coherent state” of psi. (Right?) Normally, we’d say the state of the system is the number of amoebas. So what is exp(a/b)z/exp(a/b) a state of? Hi! I’m using ‘state’ to mean ‘stochastic state’, which is a fancy way of saying ‘probability distribution’. whose coefficients are these probabilities. This kind of probability distribution is called a Poisson distribution, and this particular one is the Poisson distribution with mean . So, in this state we’re not certain how many amoebas there are: it’s random. And it’s described by a Poisson distribution with mean . Physicists call this type of state a ‘coherent state’. I’m sorry that this talk is tough to understand; I’m sure it’s partially because I’m trying to make everything seem very familiar to experts on quantum physics, which means it will seem unfamiliar to everyone else. In particular, I’m using the word ‘stochastic state’ instead of ‘probability distribution’, because I’m manipulating probability distributions using tricks that mimic those used for ‘quantum states’. A ‘stochastic state’ assigns a probability to each alternative that might occur; a ‘quantum state’ assigns an amplitude to each alternative. The point of the talk is that lots of tricks used for amplitudes also work for probabilities. So, many methods for studying quantum states apply to stochastic states as well. Needless to say, if I were explaining my work to biologists I’d put an entirely different spin on it! For example, I’d emphasize that I’m talking about a probabilistic model where each amoeba undergoes fission with a probability of per second, and each pair of amoebas engages in competition leaving one dead with a probability of per second. I’d say that in the limit of large numbers of amoebas, we can show the expected number of amoebas obeys the logistic equation. But something better happens as well! If we work out the equilibrium population for that logistic equation, and set up a Poisson distribution with that population as its mean, this Poisson distribution will remain unchanged with the passage of time if we evolve it according to the probabilistic rules I just described. And this is exactly true, even if the equilibrium population is small. Is it *really* the case that Wednesday afternoon in Singapore “is Tuesday morning for a lot of you”? Whoops. The international date line still seems like magic to me. When I get really old I plan to travel to the South Pole and run around it to rewind all those days until I’m young again. • What are some ways you can use it in reverse, and take ideas from stochastic mechanics and turn them into really new ideas in quantum mechanics? • How exactly does ‘decoherence’ turn quantum mechanical systems into systems that can be described using stochastic mechanics? The operator formalism is discussed in chapter 8, with some more references there. Is there a counterpart to the least action principle in the stochastic setting? I am sure the counterpart would be the Maximum Entropy Principle. The constraints on maximum entropy would factor in from statistical moments (the mean in particular) needed to satisfy laws such as the least action principle, conservation of energy, conservation of momentum, etc. Good question, Uwe! I need lots of questions like this. Some will have interesting answers. My favorite counterpart to the least action principle in the quantum setting is Feynman’s ‘sum over histories’ idea. In classical mechanics, a system usually follows the path that minimizes the action . In quantum mechanics, it takes all possible paths with different amplitudes. To figure out what happens, we need to sum over all paths, with the path getting weighted by the amplitude . I’ve hidden Planck’s constant in this formula by setting it to 1, but if we don’t do that, we can (nonrigorously) show that as it goes to zero, the sum over histories reduces to the least action principle. There’s also a sum over histories idea in the stochastic setting. Here we can say a system it takes all possible paths with different probabilities. To figure out what happens, we need to sum over all paths, with the path getting weighted by the probability . This analogy between the quantum and stochastic theories is very much a part of what I’m talking about. It works best in the ‘overlap’ region discussed in my talk. The relation to the principle of least entropy, on the other hand, is quite mysterious to me! By the way: the relation between the quantum sum over histories and the stochastic one is the reason we can use Feynman diagrams in stochastic physics just as in quantum physics. But I thank WebHubTelescope for nudging me to think more about how the principle of maximum entropy fits into the story. in the following way. First it will minimize kinetic energy, K, by staying still. Then it will go on to minimize potential energy, V. So, people usually say statics at temperature zero is governed by the principle of minimum potential energy. where T is the temperature and S is the entropy. Note that this principle reduces to the principle of minimum energy when T = 0. • The principle of maximum entropy: for a closed system with fixed energy, the entropy is maximized at equilibrium. • The principle of minimum energy: For a closed system with fixed entropy, the total energy is minimized at equilibrium. All these last 3 principles should really be consequences of a single one, but I’m having trouble clearly stating what it is. Thinking about this has given me some extra ideas, but I want to check them before springing them on the world. Thanks! By the way, ‘classical statics at nonzero temperature’ is usually called ‘classical equilibrium thermodynamics’. But it’s a bit more consistent to reserve the term dynamics for situations where things are really changing in time. Thanks for the answers. Keep us informed. • Mateo Polettini, Nonequilibrium thermodynamics as a gauge theory. Abstract. We assume that markovian dynamics on a finite graph enjoys a gauge symmetry under local scalings of the probability density, derive the transformation law for the transition rates and interpret the thermodynamic force as a gauge potential. A widely accepted expression for the total entropy production of a system arises as the simplest gauge-invariant completion of the time derivative of Gibbs’s entropy. We show that transition rates can be given a simple physical characterization in terms of locally-detailed-balanced heat reservoirs. It follows that Clausius’s measure of irreversibility along a cyclic transformation is a geometric phase. In this picture, the gauge symmetry arises as the arbitrariness in the choice of a prior probability. Thermostatics depends on the information that is disposable to an observer; thermodynamics does not. • G. M. Schutz, Exactly solvable models for many-body systems far from equilibrium. It seems that a special class of markovian generators, called p-normal, might have intriguing properties. Usually they have real and complex-conjugate eigenvalues. When you reverse the direction of time (there’s a well-defined way to do this…), imaginary parts of the eigenvalues change sign while real parts remain the same. • Mateo Polettini, Equivalence principle and critical behaviour for nonequilibrium decay modes. • J. Schnakenberg, Network theory of microscopic and macroscopic behavior of master equation systems. I don’t know what ‘p-normal operators’ are, or ‘normal systems’, so I need to learn the definitions of those.